For many years in South Africa, tennis was just an affluent white man’s sport. Over the past years the game has become increasingly widely spread, with acclaimed tennis players coming from all walks of life across the country. Despite this shift in the game, kids living in the poorest of townships in the country have very little access to the chance to learn tennis. Your role, as a volunteer tennis coach, is to get these disadvantaged kids involved in the game- and give them the chance to excel at it. Working alongside other volunteers, you will take the kids into small groups to teach them various bits about the game. You may be starting very simply, and then with the progression of time even being able to set up games. Starting with simple ball to racket exercises, you will soon be able to progress to short court games, serving and going over the rules. You will get full support and teaching on how to coach the sport, so even if you haven’t done this before, it is certainly something that you will grow into. The kids really need involvement in sport to give them opportunities that they might not have elsewhere in their lives. Sports are not coached as part of the curriculum in these townships, and so taking part in this programme means actually giving the children something that they would not otherwise have. The practice of sports teaches them motivation, team work and determination… as well as getting them to think strategically whilst having a lot of fun! You don’t need to be a tennis pro to take part in this programme- just have a passion for the game and a will to teach. Whether you are on your gap year, career break or simply taking some time out, the kids will love you for it, and you will become a role model for many of them. Having access to international coaching is something that they will never forget. The programme runs from 5 – 12 weeks throughout the year in accordance with the school terms. We really encourage for volunteers to take part in the 12 week programme so both you and the kids get the most out of it. Oyster sends volunteers to coach hockey, football, rugby, swimming, netball, tennis and cricket in Port Elizabeth. 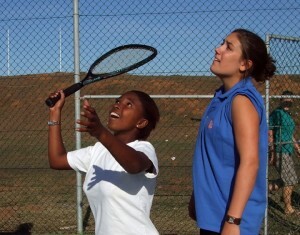 The tennis coaching is just one part of the whole sports coaching programme. Tennis coaches will be living and working with all other coaches and childcare and teaching volunteers, and you can even coach a variety of sports whilst you are there. Just let us know which your favourite sports to coach are!